Dr. Ali Sepehr overviews his method for providing patients with a full understanding of what to expect from a brow lift procedure prior to surgery. Irvine, CA – At The OC Center for Facial Plastic Surgery, Dr. Ali Sepehr discusses every facet of the brow lift procedure with his patients to instill realistic expectations. He provides each patient a complete understanding of the procedure in which they are interested by thoroughly discussing not only the benefits, but also the risks and limitations. According to Dr. Sepehr, about 10% of his surgical patients receive brow lifts. Typically, he considers a good candidate for the surgery to have brow skin that has sagged below the brow bone, creating heavy upper eyelids. Additionally, he notes that another reason patients come to him requesting the surgery is to smooth hooding skin at the outer corner of their eyes, which also contributes to crows feet. Dr. Sepehr says he finds the brow lift procedure can diminish forehead lines and crows feet, while also helping rejuvenate the eyelids. In fact, he adds that about half of his upper eyelid surgery patients also receive a brow lift due to the procedure’s effectiveness. Each brow lift patient at The OC Center for Facial Plastic Surgery receives a procedure customized to their needs. Depending on the amount of loose brow tissue they have, Dr. Sepehr will adjust his brow lift technique to ultimately provide the smooth, youthful appearance patients desire. During the consultation and pre-operative appointments, he will sit with patients in front of a mirror to establish how much, and in which direction, lift is needed to achieve their desired results. At this time he will also discuss the details of the surgery. In Dr. Sepehr’s opinion, “It is important to know what each approach can accomplish but also what it cannot accomplish.” His goal is to provide patients with the most thorough understanding of a procedure and not encourage false expectations. 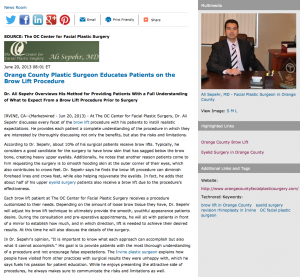 The Irvine plastic surgeon explains how people have visited from other practices with surgical results they were unhappy with, which he says fuels his passion for patient education. While he enjoys presenting the attractive side of procedures, he always makes sure to communicate the risks and limitations as well. Dr. Sepehr strives to keep patients informed from the consultation through the recovery. Since each of his patients undergoes a procedure altered for their specific needs, he says recovery will vary as well. Dr. Sepehr finds, however, that most of his patients feel presentable as soon as a week after their surgery. For anyone interested in the brow lift procedure, he encourages them to discuss the procedure with a board-certified surgeon to address any questions or concerns. Dr. Ali Sepehr specializes in the art of facial plastic surgery, offering cosmetic procedures ranging from facelift and revision rhinoplasty, to neck lift and brow lift. Having completed a highly-regarded Fellowship in Facial Plastic and Reconstructive Surgery in Toronto, he is one of only a select few fellowship-trained facial plastic surgeons. He is also a member of the American Academy of Facial Plastic and Reconstructive Surgery and a Diplomate of the National Board of Medical Examiners. As an author featured in many facial plastic surgery journals, Dr. Sepehr educates others through his expertise in the field. Today, he continues to teach his specialty to fellows, residents, and medical students at the University of California, Irvine Medical Center. Dr. Ali Sepehr is available for interview upon request.